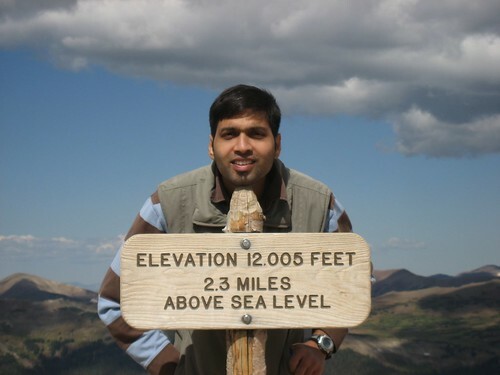 Who is Naresh Jain (@nashjain)? Ever since my childhood, I’ve seen tremendous growth around me. My dad started his business with 25 paisa in his pocket and today is a well know businessman in his business line. My uncle, who left home in search of a job and started as a laborer in a plastic factory, today is one of the biggest exporters of pens in India. Another person I’ve known is a 7th grade drop out from school, today runs some of the most prestigious educational institutes in India. When one is surrounded by such inspiring stories, how could one rest in peace? I remember quite clearly, I must have been 9 years old, there was some dirt on the floor and some customers were about to come to my dad’s office. Without a second thought, my dad picked up the broom and cleaned the floor. He could have easily asked one of this employees to do it, but he decided to lead by example. And this was a repeated story with all the successful business tycoons I’ve known. They don’t just lead by example, but are extremely hard-working (at least 16 hour workdays), very opportunistic, don’t shy away from mundane work and are perfectionists when it comes to quality. I would like to believe that these qualities have shaped me. I have no idea, but I would have certainly liked to be involved in creating a documentary for the National Geography channel. Some people say I certainly have a second career as a small-time chef or an event organizer. I used to organize hikes and other outdoor activities for corporations, that’s another thing I would love doing. Personally, I think the sky is the limit. Richard Matthew Stallman (RMS) is one of the main reasons I got into the software industry. Even though today, I don’t completely agree with his philosophy, he has certainly shown me the way. I’m challenged in many ways. One of my big challenges is that I can’t read. Period! Let it be books, newspapers or articles. As soon as I read a couple of lines, I start imagining what the author was trying to convey. 15 mins later I catch myself day-dreaming. Since I could not read, I thought let me start blogging, at least this way, before writing some crap, I would go and read some stuff. 9 years later, I’ve only been writing hardly reading. Along the way, I discovered that organizing conferences and user groups was a fantastic way to learn from people and fill some of the void that was created due to lack of my reading skills. Over the last 7 years, I’ve organized 50+ conferences across the world and I must say, the conferences and user groups have really helped me meet and network with many authors I would have otherwise never met. Another big challenge I have is, I get bored with things really fast. Which takes us to the next question. Since I get bored with things really fast, I use it as a way to drive me to learn and experiment with new things. The desire to explore and see what lies on the other side has been a great driver for me. If I look back, I think the best is yet to come. I’m particularly happy about walking into a difficult situation, understanding the context and changing the direction to get the group out of the difficultly. I’ve consistently done this in different contexts ranging from hiking to adventure sports to event management to teaching a class to coaching a team or dealing with a personal crisis situation. IMHO everything else is just a manifestation of this underlying force. Actually I cheated, I listened to the audio book of Stumbling on Happiness – This really helped me understand certain human behavior that was hard to grok. What crossroads of your life are you at? Currently I’m at a very uncomfortable position in my professional life. I’ve started to question everything I’ve practiced, believed and knew. I’ve started to see the other side of the coin in everything I do. For example: While I’m a big proponent of self-organization and democratic teams, I’ve started seeing how a charismatic dictator can achieve, if not better, equal results. While I believe basic code & process hygiene is important, time and again, I’ve found extremely successful companies (whose products I love to use and have changed the way I think of the universe) violating every single thing I thought was good. So here I am, questioning everything and beginning my journey all over again. On this very fact I’m tripping (happy) in my life. What are you up to these days in terms of your work? I’ve been trying to transition from a full-time agile trainer/coach to a tech-start-up founder for the last 3 years. Currently I’m heading 2 Tech-Startups. This transition has been really hard, but I believe extremely important transition for me to learn and grow. The thing about coaching and training is, its low risk & extremely easy money. Its hard to leave cash on the table to go figure out a product that may or may not solve a real problem. Why don’t you want to continue as a full time agile trainer/coach? The harsh reality of consulting is, after a while you stop learning and experimenting. You try to perfect the art, so you can sell it to others. In the process, dogma sets in and knowingly or unknowingly you become a snake-oil-salesman. I seriously dread that feeling. I fear going into organizations and preaching them stuff without myself having built successful products from scratch.